Of course I love the lady-like look of Chanel. From their quilted bags to their tweed jackets, what's not to love? While I do own several Chanel bags, I've never quite gotten around to purchasing one of their signature tweed jackets. Luckily, however, I don't need to because plenty of brands offer Chanel-like jackets at prices that allow me to save up for one of their bags instead! Over the last months I've gotten several of these such jackets, including this one I am wearing from SheIn that's only $30! 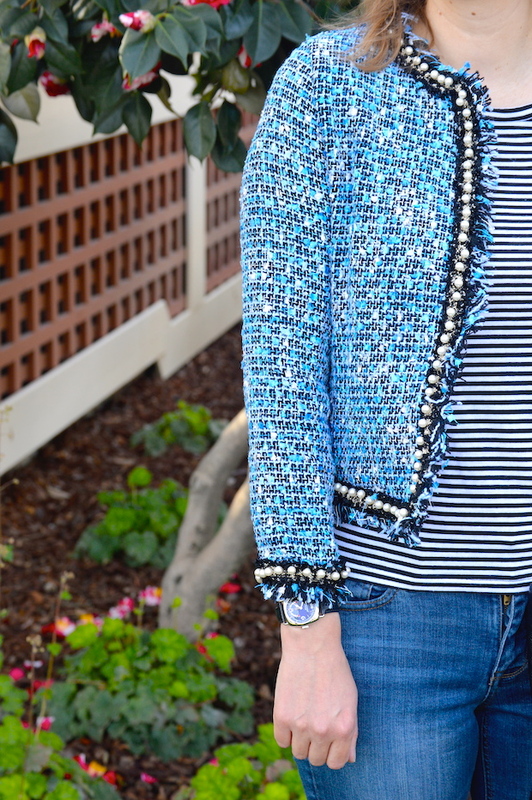 My favorite part of this jacket is the pearl details on the edges. As I mentioned before, the jacket has a lady-like look, but the frayed edges also gives it some edge. To play that edginess up, I'm wearing the jacket with distressed jeans and a striped t-shirt for a more casual look. It could, however, also easily be paired with a skirt or dress pants for a more work appropriate look. 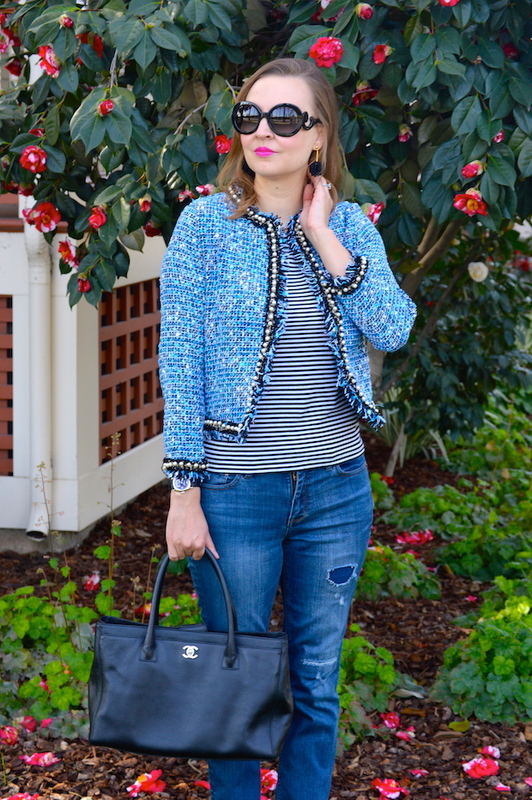 SheIn has quite a few similar jackets with tweed and pearl detailing, which I have linked to in the about my outfit section of this post. The nice thing is that, like the jacket I am wearing today, all of the options are only around $30! Regarding what I paired the jacket with, I almost forgot to mention that I am wearing at least one thing that actually is Chanel! Of course, it's my tote bag and is the real deal. It was actually the first designer bag I treated to myself to and I remember that when I purchased it, I promised my husband that it would be my only expensive bag. Well, one designer bag was clearly not enough and so it set off a chain reaction of many, many bags to come, including a new Chanel that I recently purchased in Las Vegas and can't wait to debut next week. Of course, this chain reaction was much to my husband's chagrin! Regardless, please stay tuned for my new Chanel bag's debut! Such a great look, I love how you styled these pieces, casual yet polished and chic! 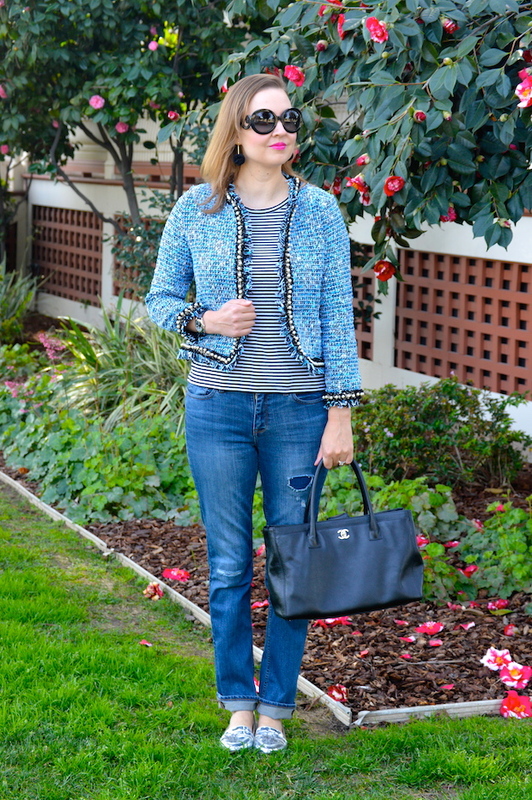 I have a small collection of tweed jackets that I adore!